died November 2, 1992 in Los Angeles, California. Probably no producer’s work has brought the world more laughter than that of movie pioneer Hal Roach. Dating from 1914, Hal Roach Studios has produced silent motion pictures, sound short subjects and feature-length films, radio and television. The best of it is still in great demand on television and home-movie form. With each passing year, in act, the effortless style and finesse of films starring Our Gang, Harold Lloyd, Laurel & Hardy, and Charley Chase makes hem look better and better. As a boy, Hal Roach seemed to have been everywhere and done everything. His own youth was as colorful as anything ever depicted in his films. He had met Mark Twain, and his grandfather lived on a plantation in Virginia adjoining one owned by Robert E. Lee. He was an adventurous drifter turned Alaskan prospector turned mule skinner when he saw an ad offering a dollar a day for experienced cowboys to serve as technical advisors on movies being made at Universal Studios. It was 1912. Roach journeyed to the film capital and rose rapidly from movie extra to movie producer, with short stops at all the posts in between. 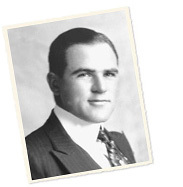 On the strength of a small inheritance Hal Roach launched his first production unit in 1914, using the fresh, rolling Los Angeles parks for locations and the stories he wrote while en route for scripts. The stories were always elastic enough to fit any circumstance. The first star Roach created was Harold Lloyd, whose pictures during the 1920s grossed more than anyone else's in Hollywood. With Roach as his producer and often his director, Harold Lloyd developed an exciting, sophisticated style of comedy. One couldn't build a successful studio on just a single star though, and Roach spun off supporting characters, like Snub Pollard (into his own series) and later Sunshine Sammy (into Our Gang). Stan Laurel was signed from vaudeville and given a series, too. By 1919, on the threshold of comedy's golden age, Roach had prospered and built his own fun factory, nestled in the low green hills of Culver City, not very far from Hollywood. The administration building was covered with ivy, and the picturesque little comedy plant became known as the green ivy studio. It would be comedy's home for nearly half a century. During the 1920s and 1930s, among those who starred in their own series under the Roach banner were Harold Lloyd, Harold's brother Gaylord Lloyd, Charley Chase, Chase's brother James "Paul" Parrott, Mabel Normand, Snub Pollard, Thelma Todd and ZaSu Pitts, Thelma Todd and Patsy Kelly, Stan Laurel, Laurel & Hardy, Max Davidson, Theda Bara, Harry Langdon, Irvin S. Cobb, and Will Rogers. There were other series, not named for their individual stars, including, of course, Our Gang, The Boy Friends, The Hal Roach Comedy All Stars (meaning no stars), The Taxi Boys, The Dippy Doo Dads, and others. Some of the notable writers, directors, and photographers who got their start and learned their craft working on these same Roach pictures were Leo McCarey, George Stevens, Frank Tashlin, Gordon Douglas, William Beaudine, Tay Garnet; Frank Capra, Hal Mohr, George Marshall, Clyde Bruckman, and Frank Butler. Among the performers who graduated from Roach comedies on their way to stardom elsewhere were Jean Harlow, Lupe Velez, Janet Gaynor, Jean Arthur, Bebe Daniels, Fay Wray, Paulette Goddard, and Boris Karloff. People like these who worked at Roach during its first quarter century have characterized the studio as a wonderfully warm place, with a lighthearted close-knit "family" atmosphere unique even among movie studios. It was "family" in more ways than one. The extras in Roach pictures were often the friends and real family of both stars and the studio stock company of character actors. Everyone from the directors to the grips loved comedy, loved what they were doing, and worked in remarkable harmony to create the most endearing, enduring short films ever made. The love showed, and the care showed; Roach comedies have unmistakable charm and style. They're comedies not only of slapstick and spectacular gags, but often of tender feeling and whimsy, too. Although Roach had made some serials and dramatic features, the studio's first twenty years had won Roach renown as producer of the finest short comedies in the industry. By 1934, however, the looming twin menaces of double bills in exhibition and block booking in distribution were slowly smothering the short subject. The Depression had given birth to the double-feature concept, offering audiences more for their money, and the traditional movie program of one feature film supported by various comedies, musicals, cartoons, and newsreels was being disarranged as a result. The whole thing was an economics-related proposition. Short subjects were not being dislodged because as a group they were less popular or of lesser quality than the second feature. It was instead a matter of dollars and cents. Shorts were costing more and more to make, while due to double bills the potential for increased rentals was dwindling. Then there was block booking. For a while, major studio powers like M-G-M, Warner Bros., and Columbia could continue to subsidize short subjects that they could both produce under the same roof with features and distribute in the same sealed package, forcing theater owners to take the shorts in order to play the features. A short comedy specialist like Hal Roach could use neither industry trend to his advantage. He made features only incidentally, and so he couldn't cash in on double bills. And since he was a producer, not a distributor, he couldn't engage in block booking. The only course was to begin making features instead of shorts, or perish as a producer. Reluctantly, the studio tested its short subject stars in features, while at the same time acquiring new and different properties to develop as features. At first, Roach imprinted the same stamp of quality on his features that had characterized his short subjects: good production values, technical gloss, strong casts, etc. Such wonderful Laurel & Hardy features as Sons of the Desert and Way Out West were critical and commercial successes, as was the trilogy of droll Topper features, and also the film version of John Steinbeck's powerful Of Mice and Men, probably Roach's masterwork. One Million B.C. was notable for a collabortion with D. W. Griffith. Roach's foray into the genre of screwball comedies gave us such diverting features as Turnabout and Merrily We Live. Fast and lively swashbucklers included Captain Fury and Captain Caution. While all this was going on in the late 1930s, Roach had an idea that edging back to shorter length features, "streamliners" he called them, would be successful as an answer to the double-feature problem. They were moderately so, and a couple dozen were released, but the concept never really took hold. 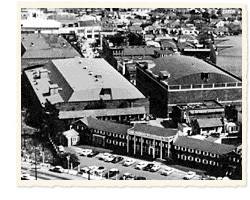 The Air Force was encamped on the studio back lot during World War II, engaged in specialized film projects. Ronald Reagan spent the war there at Fort Roach. Roach himself, then in his early fifties, was called back into service as a lieutenant colonel and stationed in England. He even saw action in the Normandy invasion. Coincidentally, before the war, he'd been a business partner of Mussolini's for some projected Italian films that were never made. After the war Roach admits he'd lost some of his moviemaking zest. United Artists, which was then distributing his pictures, was not doing very well, which made producing for theatrical consumption a shaky proposition. All this, coupled with Roach's desire to return to short comedies, brought him to the field of television, where he pioneered once more. Besides being the first Hollywood motion-picture company whose product was photographed entirely in color (Cinecolor), Roach was also then the only studio devoted exclusively to producing films for television. Beginning in 1948, among the scores of early TV series produced by Hal Roach (or filmed at his studio) were Amos ‘n’ Andy, Screen Director's Playhouse, My Little Margie, The Lone Ranger, Blondie, Groucho Marx De Soto, Abbott and Costello, Beulah, The George Raft Show, The Life of Riley, Racket Squad, Trouble with Father (The Stu Erwin Show), Oh Susannah, Fireside Theatre, and Topper. John Ford, Buster Keaton, and John Wayne were among the many big name stars and directors who worked on Roach television programs. Sadly, planned TV series to revive both Our Gang and Laurel & Hardy never reached the air. In 1955 Hal Roach sold the studio to his less creative son, Hal, Jr. Soon after, it became part of an industrial combine that in time crumbled, bringing down the last of the small studio empires in the financial collapse. In 1959 the studio declared bankruptcy. After reorganization, with Hal Roach, Sr., back in charge, some few projects were made, but mostly the studio has been content with global distribution and licensing of its many literary properties, remake rights, and motion picture and television film backlog rights. After Roach sold his interest, the new owners got involved with the controversial colorization of films. More recently the company was merged, then sold, went bankrupt, and has been sold again. Richard W. Bann is a film historian and co-author of "The Little Rascals: The Life And Times Of Our Gang" (New York, 1992).